When a customer enters a brick and mortar store and browses the aisles of available products, a retailer can utilize any of the five senses to influence purchasing decisions. If you have ever visited Chicago you know that the smell of Garrett popcorn can be picked up from blocks away, enticing all those who wander into the general vicinity. What if that popcorn had to be sold strictly based on a photo and a few lines of text? Better yet, once unable to use their nose as a guide, would anyone not already looking for a mid day popcorn snack be inclined to seek out the shop? In eCommerce, these are challenges that each and every retailer faces. The softest cashmere blanket can look just like cotton in photo and certain price tags can appear unjustifiable without context. 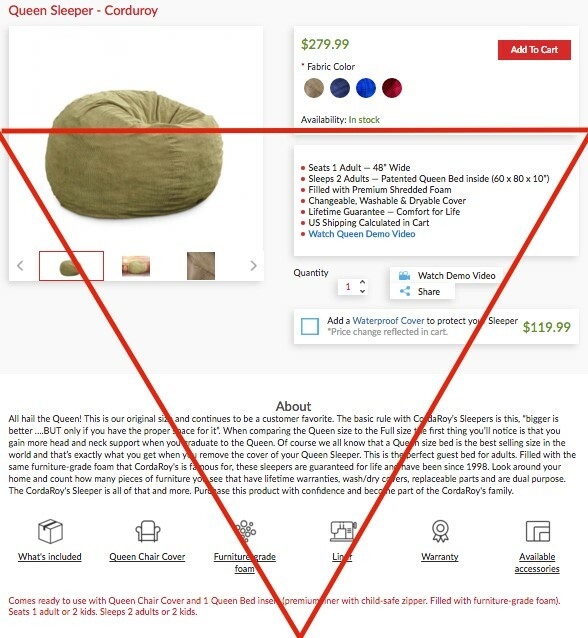 A skillfully crafted product description offsets this by further illustrating the item details and assisting the seller in painting a stronger portrait in the minds of consumers. Writing an eCommerce product description is not unlike any other sales copywriting task in that you will want to start with an understanding of the features and benefits of the merchandise. Features focus on what a product is, including specifications of materials (60% cotton) or dimensions (4” x 4”), while benefits depict what the product does or could potentially do. Often the features can be displayed as a separate section such as “Specifications” below or above the detailed product description. It is ineffective for ecommerce descriptions to be feature-only as that makes for dry content that the audience is tasked to interpret and they may search elsewhere to fill in the missing details, turning to third party reviews or other retailers. To incorporate benefits you need to take the time to analyze your audience and consider what story can be pieced together to appeal to their specific circumstances. Developing a buyer persona, which generalizes a typical consumer in your audience, tasks you to outline the wants, behaviors, attitudes, and pain points of your target consumer. A product listing for a 12-foot microfiber sofa covers the features of the item but isn’t connecting that to any benefits. If your primary target for this sofa is a large family, you want to include benefits to their known needs for day-to-day hard wear and longevity in the description. The sofa isn’t just large, it’s family sized. The material is microfiber so it is very durable and resistant to stains and snags. Use these highlights to create a story. This copy can be spun differently to incorporate benefits to meet the needs of another target group as well, such as a single hostess who frequently entertains. A few of these illustrative attributes coupled with the cut and dry stats of the item create a stronger product description. Product imagery does most of the visual heavy lifting for eCommerce listings, and we address the impact of product photography here, but the copy of the product description should also be drafted with visual elements in mind. While content is important, you don’t want to overwhelm the visitor. Keep the page breathable with plenty of whitespace between and break up larger paragraphs with spacing or headings. Today around 30% of eCommerce sales are from Mobile (source) where users scan past and skim through content briefly. The product description should be kept concise, no more than 250 words, so that it is more palatable to users on all devices but especially when viewed on mobile. To get as much indispensable content absorbed in the shortest amount of time, utilize the inverted content pyramid structure. This composition organizes the important points at the beginning of the copy, where the most attention is given by the reader, followed by supporting details and background information that are useful but not essential. In keeping with skim friendly content, consider integrating a mix of bullet points and paragraph text. The bulleted list should outline product features that will answer upfront consumer questions and prompt them to read the more in depth, benefit rich, copy. Typically no less than 5 and no more then 7 points are recommended to create this snapshot, which should not be relied on solely, but be accompanied by a detailed product description. 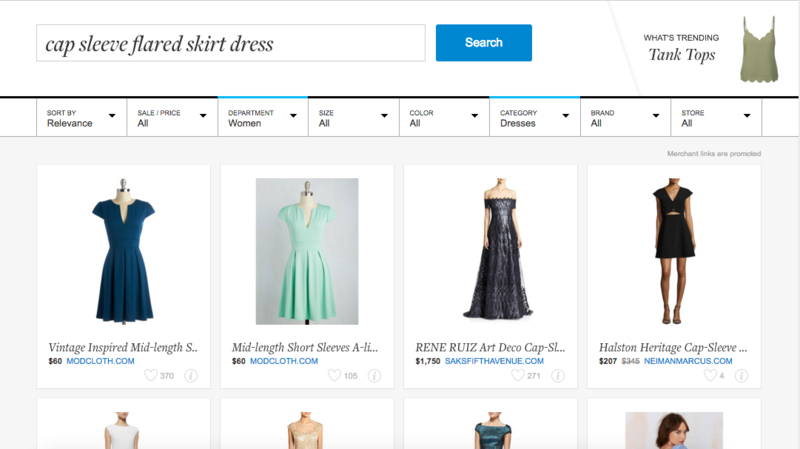 In addition to motivating a consumer to purchase from the product detail page, ECommerce product descriptions provide customizable content that can be leveraged to boost search rankings and attract consumers to the purchase point in the sales funnel. Search engines take into account unique and updated content, so steer away from copying descriptions direct from suppliers or other product listings. Displaying product reviews could potentially provide free, fresh, user-generated content, which will be picked up well by Google. Additionally, researching potential keywords to identify low competition words and phrases will establish a list of terms, which can be used in the product description to draw traffic and sales. The more general the term, the more competition there is for existing or emerging products under that umbrella. To get more specific, you don’t have to abandon all of the more general terms; you just need to string them together to form a long-tail keyword or phrase. Not only do long-tail keywords couple vague search terms to make them more specific and thus less competitive, but they also target a smaller market of consumers who are more willing to follow through with a purchase. 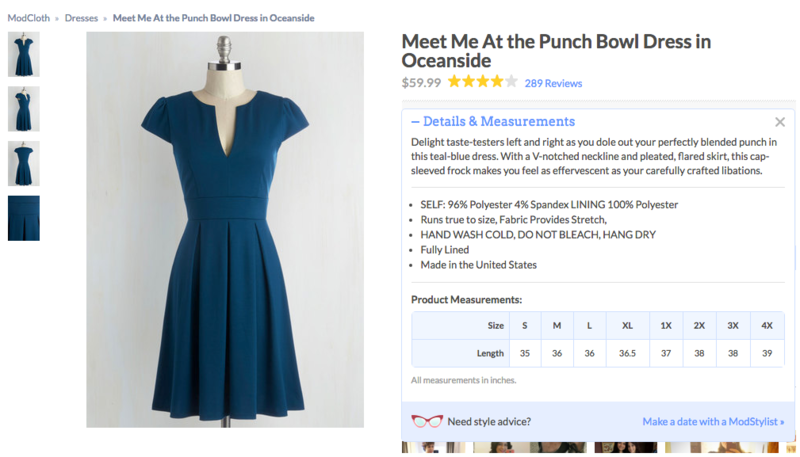 Product descriptions are an opportunity to craft creative and unique content to attract traffic to your eCommerce site and prompt purchases from individual product pages. Successful descriptive copy shows a clear understanding of the target customer, keeps SEO in mind, and has a good balance between informative and persuasive. However, these are all aspects of eCommerce that don’t simply end with the drafting of product descriptions. Equally as important is ensuring that all pages, not just product details, are SEO optimized, content rich, brand consistent, and mobile friendly. For guidance on any of these aspects of eCommerce selling, reach out to our team. Sky handles account coordination for FarShore’s growing client base. Her role, which includes on-boarding partners and streamlining communication during project engagements, pulls from her background in operational organization within IT and Professional Services. Sky is a recent Columbia College Chicago graduate with a Bachelors in Marketing. Is My Mobile App Idea Any Good? iOS or Android: Which app version should you build first? I have an idea for an app: where do I start? What is the difference between a sketch, wireframe, mockup, and prototype? 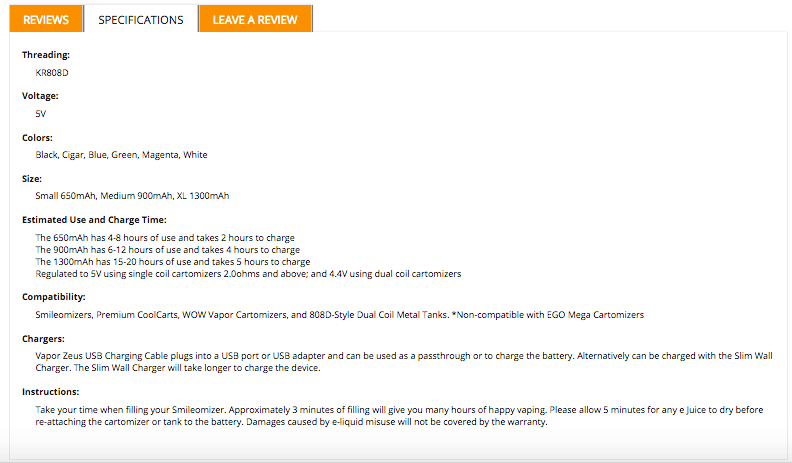 Product descriptions writing is useful from me not only me i think this post is helpful for all . Thank you so much for this post here . Thanks! Sky LaSorsa for writing such an interesting post! I want to add something here that, I believe, will help your readers. nnWriting product descriptions keeping buyer persona in the mind increases the chances of sales. And the result amplifies if we use the right tone of voice that our buyer persona uses. And you rightly pointed out that design matters a lot in product descriptions. Copyright 2019 FarShore Partners, LLC. All rights reserved.